The "Today" show team sang lyrics from "Islands in the Stream." 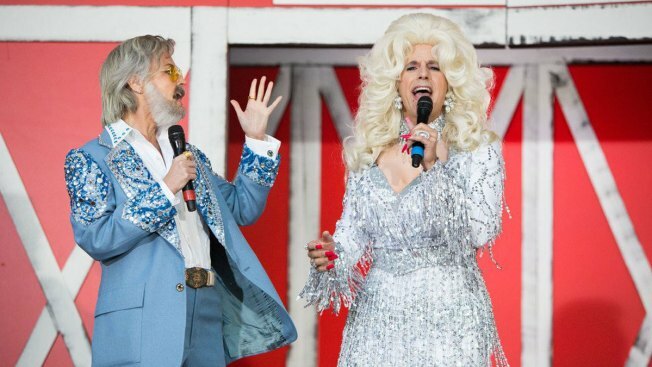 The "Today" anchors rocked country-themed costumes Tuesday for the show's annual Halloween costume reveal, with Matt Lauer dressing up as Dolly Parton and Savannah Guthrie as Kenny Rogers. It was Lauer's latest turn as a woman for Halloween, having dressed in past years as Pamela Anderson from "Baywatch" and Lucy from "Peanuts." Reba McEntire emceed the festivities and introduced Carson Daly as Billy Ray Cyrus. Daly took to a stage with the real-life Cyrus for a rendition of "Achy Breaky Heart." Al Roker emerged from a smoke-filled car as country legend Willie Nelson to the tune of "On the Road Again." Next up was Megyn Kelly as Shania Twain (and she later earned a hug from the real Shania). Hoda Kotb emerged next dressed as Blake Shelton. The "Voice" star joined her on stage and performed later in the morning. Kathie Lee Gifford rounded out the group with her best Miley Cyrus. "We rely on each other," everyone sang.